Hand spun with brass Netherton rivet. Iron cake tin are tough and can be used at very high temperatures. Put the teabag in a jug and add the boiling water. Leave to steep for 10 minutes. Remove the teabag and add the dried fruit. Leave to steep until the tea is cold. Strain off the liquid, which, incidentally makes a terrific drink, and reserve the fruit. 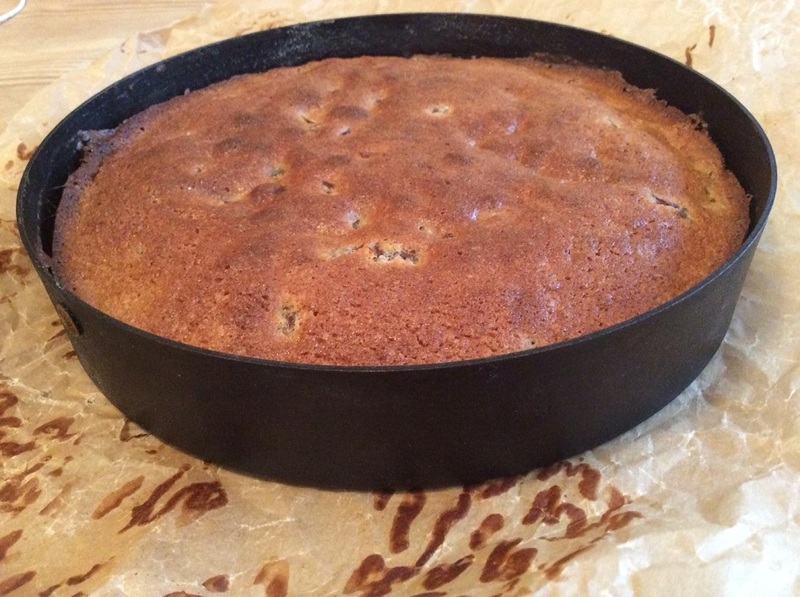 Grease a 8½" cake tin and dust with flour or ground almonds. You can tip any excess into the cake mix. Beat the butter and sugars until light and fluffy. Add the eggs and mix thoroughly. 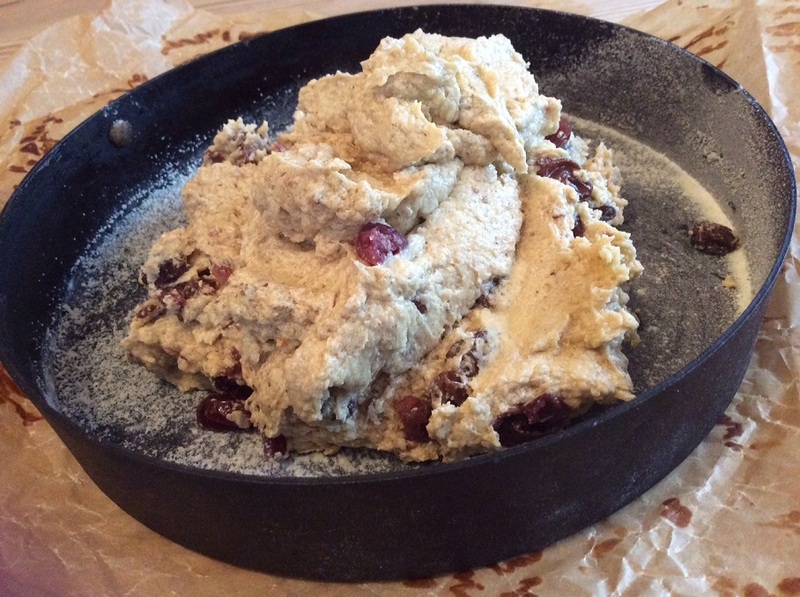 Fold in the almonds and flour and then stir in the steeped fruit. Spoon the mixture into the prepared cake tin and bake for 20 minutes. Leave to cool for 10 minutes, then turn out onto a cooling rack. 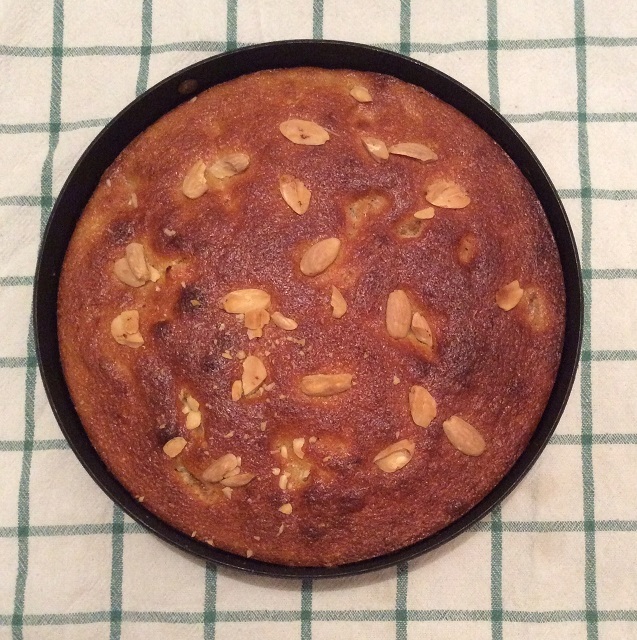 A scrumptious, scented apricot cake, which makes a great dessert. It's reassuringly simple to make, but the inclusion of the rosemary and lemon lifts it out of the ordinary and the Mascarpone gives it a luscious moistness, lending itself to dessert status. Of course, you could just eat it with a cup of tea, I think Earl Grey would be particularly complimentary. However you choose to indulge, I am sure you will enjoy this. Put everything into a small pan and simmer gently until all the liquid has been absorbed by the apricots. Discard the rosemary and lemon zest and set the apricots aside to cool. Grease and flour an 8½" cake tin. Chop the cooled apricots. Beat the butter, Mascarpone and sugar until light and fluffy, then add the eggs and vanilla and continue beating thoroughly. Stir in the flour, ground almonds and chopped apricots. Spoon into the prepared cake tin and spread evenly. 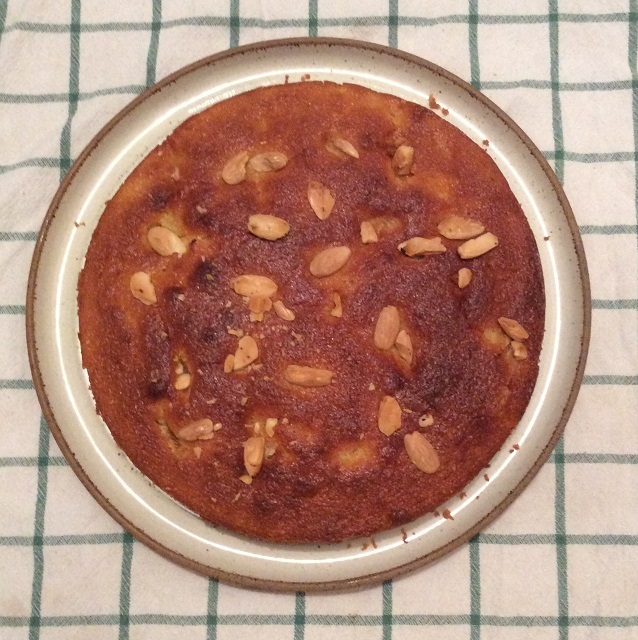 Scatter the flaked almonds evenly over the top of the cake. Place in the oven and cook for 20 minutes, or until a skewer comes out clean. Leave to cool for 10 minutes, then turn out of the tin and serve with more Mascarpone or better still, some clotted cream. This cake is a variation of a much loved steamed sponge and is a light and luscious foil for the tart rhubarb topping. Cut the rhubarb into thumb sized pieces and place in an oven proof dish. Sprinkle liberally with sugar, you will have to decide for yourself how much you need, I used a couple of tablespoons. Place in the oven for about 20 minutes until it is soft, but still holds its shape. Set aside while you make the cake mix. Beat the butter and golden syrup together until light in colour and thoroughly combined. Beat in the eggs. really beat in the eggs, then beat a bit more. Fold in the flour and ground ginger. Spoon the cake mix into the prepared tin and level it. 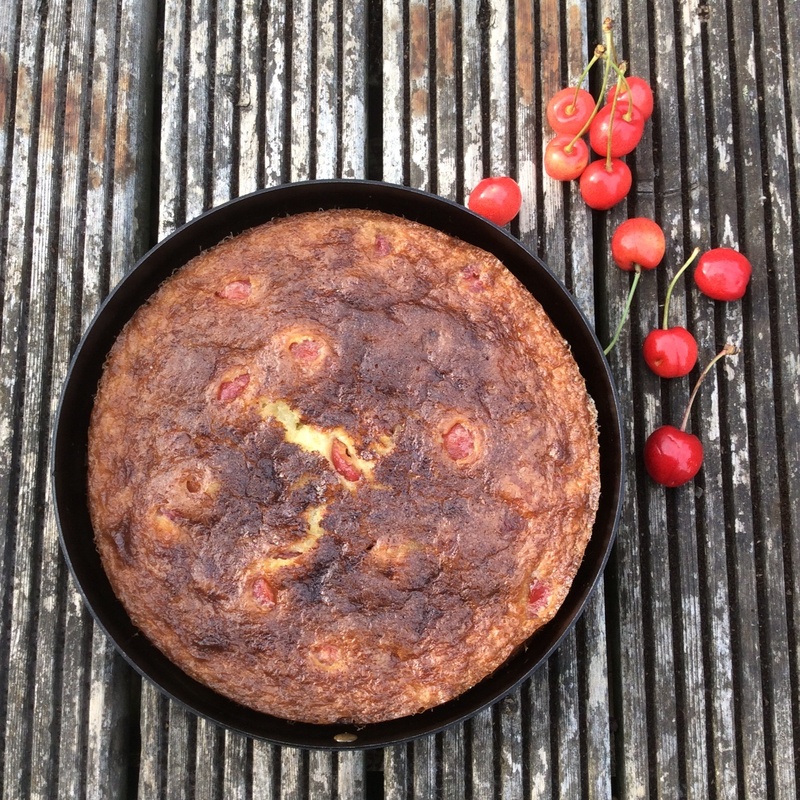 Carefully place the cooked rhubarb on top of the cake mix and put the tin into the oven. Cook for 20 - 25 minutes, until a skewer inserted into the middle of the cake comes out clean. Serve at room temperature with cream or ice cream. 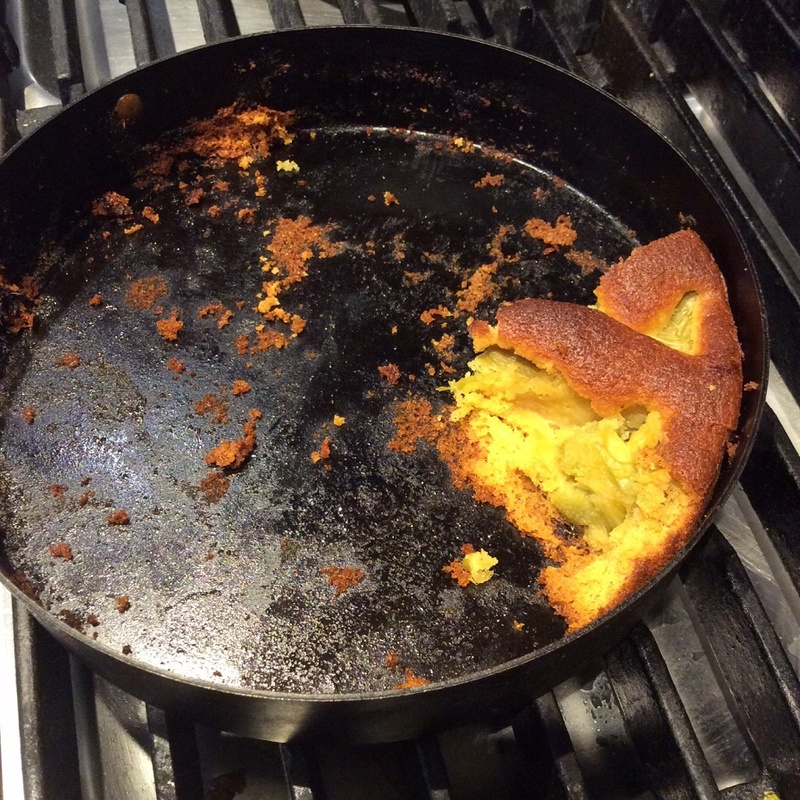 Grease a cake tin and dust with flour, tipping out the excess (use rice flour if you want to make this gluten free). Whisk the eggs with the sugar until the mixture leaves a ribbon trail when you lift out the whisk. Add the melted butter and the sour cream and continue whisking. Fold in the ground almonds and carefully pour the batter into the prepared tin. place in the oven for 25 minutes. Turn off the heat and leave the tin in the oven for a further 10 minutes. This is a fragile thing, delicate as a beeswing, so it's better to serve it straight from the tin, rather than attempting to turn it out. If you are being posh, do this away from the table, dust each plate with icing sugar, put a couple of stoned, fresh cherries on the side and serve with creme fraiche and an ice cold tot of cherry vodka.